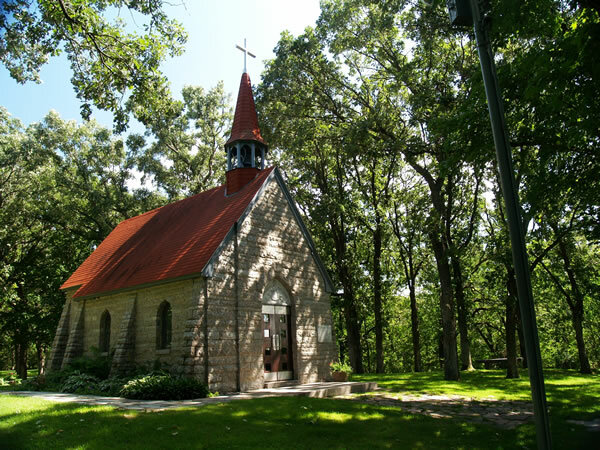 Overlooking the town of Cold Spring, the Assumption Chapel is nestled among the towering trees. Each year, thousands of people revel in the tranquility, beauty and mystique of the grounds. The history of Assumption Chapel is legendary. It is the story of townspeople gathering together in efforts to rid the area of grasshoppers that were destroying farmers’ valuable crops. The invasion happened within the course of 24 hours. One day the grain crops promised a bountiful harvest. By the next afternoon, they were blanketed by millions of Rocky Mountain grasshoppers. Farmers made every effort to stop the swarming insects but to no avail. The crops were destroyed, and, even worse, the grasshoppers honeycombed the countryside with eggs that would hatch next spring. 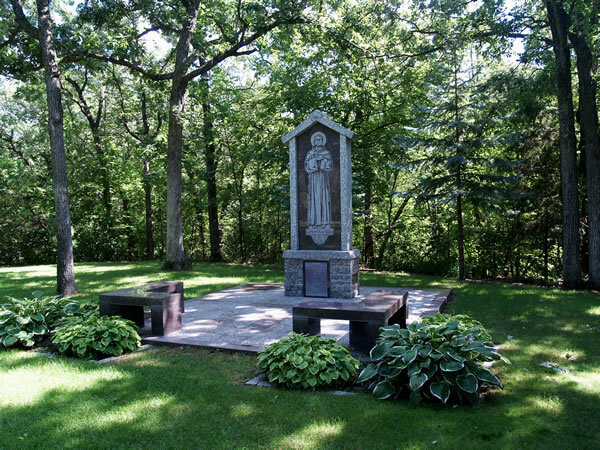 Minnesota’s governor proclaimed April 26, 1877, a day of prayer and throughout the next few months the people of the Cold Spring area continued to pray. 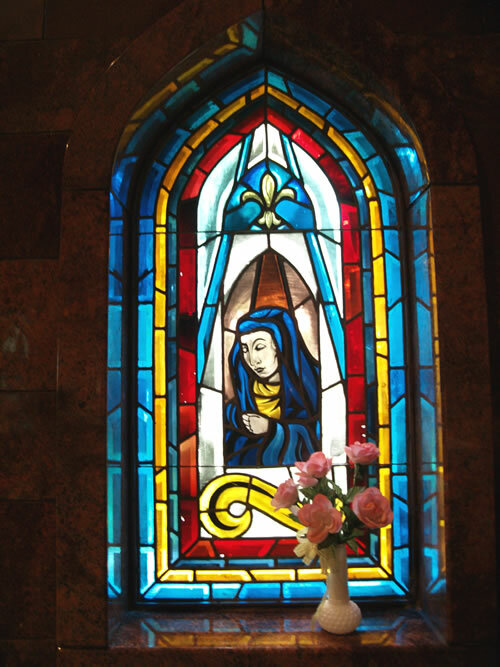 They vowed that if the Blessed Virgin would rid them of the grasshoppers, they would build a chapel and offer prayers to her for the next fifteen years. Construction of the chapel was the idea of Rev. Leo Winter, O.S.B., during the summer of 1876-1877. The next day, the grasshoppers were gone. The people kept their promise and built the chapel on a hill halfway between the parish in Jacobs Prairie and the mission in Saint Nicholas. However, the first structure of Assumption Chapel was made of wood and a tornado in 1894 destroyed the chapel. Not until 1951 was the chapel reconstructed by Father Victor Ronellenfitsch, O.S.B., and the parishioners of the Church of Saint Boniface. 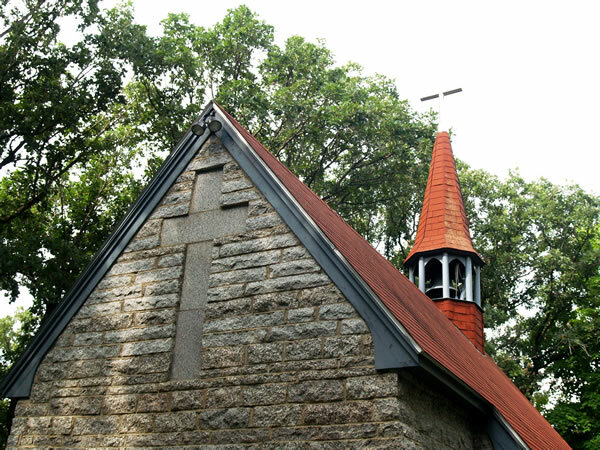 Granite was donated for the structure in addition to other supplies, and the Assumption Grasshopper Chapel remains in existence today. Assumption Chapel is located in Cold Spring off of State Highway 23 and Chapel Hill Street, just off of Pilgrimage Road. A pamphlet detailing "The story of Mary and the Grasshoppers", written by Robert J. Voigt, is available at the chapel and at the Parish Office of the Church of Saint Boniface for a donation of $1.00.